Little House Home Arts: New Glutton and Guilt-Free Diet! New Glutton and Guilt-Free Diet! As I prepare for company, I am thinking about possible menu options. Mind you, my company will only be visiting me for a few hours, and so likely I will get but one chance to wow them with my cooking. I am smiling as I write this, as I gave up all culinary arts this last year, so preparing anything will be done with great trepidation. I will try to solicit my daughter to do food preparation for the one meal that they will be with me. It will be easier that way. Her culinary skills far surpass my own, though I once considered myself a good cook but not now! What happened to dissolve my skills and confidence, I wondered? I think it began a very long time ago...Having a tendency to put on weight from the time I was very young, my mother worked hard to keep me on a balanced diet. She used to tell the story of taking me when I was just a little girl, to Downtown Omaha to go shopping at Macy's Department Store, which always included eating lunch out and she learned to order nothing but mashed potatoes and gravy for me! What is balanced about that you ask?... Likely her checkbook! She was not a stupid woman and when that is all I would eat off my plate, why pay for more? You can laugh now...but this is how one thing led to another until I gave up cooking! When not eating out, my mom tried to raise me to eat well balanced meals that would include a serving of meat, vegetables and potato/rice or noodles, and a small portion of pudding or canned fruit, that came only if I ate what was on my plate. This even included liver, albeit with ketchup in my case. Often our meals were casseroles that contained some sort of protein mixed with pasta or rice, in which case we would each get a serving along with a salad. My dad insisted that we eat well to avoid having high costly doctor bills. We also exercised well, as we walked back and forth to school everyday and almost everywhere else for that matter! She kept apples or plums on hand for our snacks and if we complained about being hungry, peanut butter and crackers was typically our option. We always had carrots or celery on hand as well, and the usual candy in the house was horehound or anise hard candies. If you have ever had horehound or anise candy, you will know that pigging out on it isn't a temptation and frequently a taste would be more than sufficient to make me run for the trash can, though I did eventually develop a acquired taste for anise! 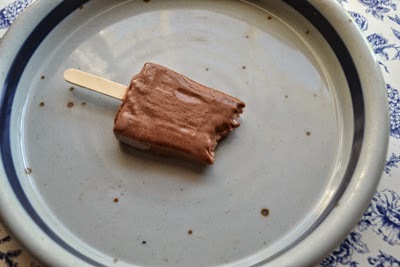 I am certain that my cousin Susan will be aghast at reading this blog, for when she and her sisters along with my uncle and aunt, who was my mother's sister, came to visit, she will remember our freezer being filled with frozen candy bars, popsicles, ice cream bars, and cakes...all generously served. Nothing was too good for company and we ourselves would love it when they finally arrived and we could feast with them! My dear mother, God rest her soul was no miser when it came to sweets and what she had, she shared. I remember Mrs. See's chocolates being sent to us every Christmas by my aunt and my mother treasured it as much as we did. In fact she made up rules about not wasting the more unusual and unpopular fruit-filled sorts of pieces. If we bit into a piece and didn't like it, we were to put the other half back in the box and they became "bonus" pieces and could be taken as a second piece. I also have fond memories of her buying bags of corn candy, and generously dividing the whole bag between us kids and herself, and then she pretended to be a chicken and would peck her corn candy. Her chicken act was so amusing that we would feed her part of our piles of candy corn as well. She was a smart mom to be sure! She taught me that sugar equaled love, and so special cakes to celebrate birthdays or holidays always had plenty of frosting, too much for those with delicate taste. Any food treats in the house would soon be gone. I soon learned to cook and loved to bake! So what caused my culinary interests to dwindle down to nothing? Gaining weight and trying to lose it, was, I think, the initial reason for my cooking decline, though later it became my illness that necessitated special elimination diets. I was likely one of the first to discover the harmful effects of being a yo-yo dieter. I wanted a nice figure and I tried all the fad diets of my day to keep it: low calorie diets; quick weight-loss diets of hamburgers/ green beans and boiled eggs; Shacklee protein soup and diet drinks substituted for meals; Nutrasystem; Weight Watchers, new and old programs and eventually even Over-eaters Anonymous. It seems I have tried them all and have successfully lost hundreds of pounds in my life time, and though I knew all the secrets of keeping weight off and read every diet book, used every imaginable "counter" and even had a little plastic pig that oinked when my refrigerator door was opened, it was all to no avail. I gained my weight back and more with every diet! Sound familiar? Now, of course there is evidence that yo-yo dieting damages the weight set points in your body and is definitely NOT the way to maintain a healthy weight! Everyone knows that exercise and life style changes in eating habits are needed to keep weight off which is easier said than done, especially when my life filled up with family responsibilities, work and chronic illness. Not being well made it very hard, if not impossible to exercise and brought with it special elimination diets,including: fat-free, gluten-free, milk-free, sugar-free, caffeine-free, alcohol and fermented foods-free, and am now on a vitamin D- free/ anti-anti-inflammatory foods-free diet, with still more specific restrictions! I learned to cook using substitutions for every ingredient, until I could boast that I was able to cook without oil, sugar, eggs, milk, and wheat. I have a whole shelf unit in the kitchen with both regular and special cookbooks alike, though such cooking involves conversions and translating every recipe into another to accommodate what my doctors thought best. Though most tasted good enough, it always involved special ingredients and a ton of work, when my illness made me too tired just thinking about cooking! I learned how to figure out how many calories were needed to lose my weight in a healthy fashion and how to count carbs, and "rate my plate". I even trained to become a diabetic nurse educator while at one of my jobs and knew how to subtract fiber counts from the total carb count, and how to factor in sugar substitutes as well, though I had long since eliminated them due to their toxicity in my system. I believed that teachers teach best if they live what they teach and so I followed a diabetic diet myself, with some eliminations as well and worked to keep my exercise regular each week. Since my balance and ankle stability weren't good enough to make walking safe, I took up lap swimming and loved it, though now, I am sadly not tolerating exercise during this phase of my treatment. Come to find out, our immunity starts in our digestive systems. and so treatment for any chronic illness begins with a nutritious diet, but after I eliminated sugar, wheat, milk and caffeine, along with Vitamin D, I still showed food sensitivities. That is when, in frustration, I threw in the towel and decided to join the rest of the world and rejected ultra strict and unsustainable diets unless I know for sure that I really can't tolerate something. I call this guilt-free eating. By staying out of the kitchen and keeping meals and snacks simple, quick and easy and sticking to "real food" versus "artificial" (except for fudgesicles), drinking lots of water and focusing on sewing and not eating, I seem to do better. I am still gluten-free, Vitamin D- free (mostly), alcohol and soda-free and I keep a daily journal of what I eat, the times that I take my medicine along with any symptoms I experience so I can see what does and doesn't work for me.This is challenge enough without beating myself up about being too scrupulous. Portion control is the basis of every diet and I have every tool of knowledge imaginable as to how to measure out correct portions, but it was our grocery cashier asking my daughter how she liked the "glutton-free" mixes my daughter was buying, that triggered the other part of my present diet. She had misread "gluten" as "glutton"! After a good laugh, we decided that we will try to live glutton-free! So what to feed my guests when they eat with me? You know what they say about "When in Rome...". My guests will likely get a taste of our new Glutton and Guilt-Free diet, and the menu will likely include my everyday restrictions and I will provide enough that they can take it or leave it, according to their preferences! Labels: Glutton and Guilt-Free Diet, meal planning for company when on a special diet. Progress Continues...Junk or Priceless Treasures?